On May 14, the National Endowment for Democracy honored the ongoing struggle of political prisoners in Venezuela with the presentation of its annual Democracy Award to Venezuelan opposition leader Leopoldo López, Caracas mayor Antonio Ledezma, and exiled human rights defender Tamara Sujú. The event was held on Capitol Hill, featuring opening remarks from NED Chairman Martin Frost, former Spanish Prime Minister Felipe González, House Democratic Leader Nancy Pelosi, House Foreign Committee Chairman Ed Royce, as well as other leading members of Congress from both sides of the aisle. Lopez and Ledezma were honored in absentia due to their imprisonment. Lilian Tintori and Mitzy Capriles, the respective wives of López and Ledezma, accepted the awards on behalf of their husbands, while Venezuelan lawyer and human rights defender Tamara Sujú accepted her award on behalf of the scores of other political prisoners. González, who is an advisor to the defense in the trials of López and Ledezma, moved the audience by discussing his own personal experiences growing up in Spain under the rule of Francisco Franco. “Half of my life I’ve spent in a dictatorship and the other half in a democracy. So I feel that genetically, I’m more prepared to withstand the struggle against a dictatorship than the loss of a democracy that could become a dictatorship. That’s why I’m so concerned,” said González. A short video was also screened at the event, explaining in detail the situation in Venezuela. The video included exclusive new video messages from numerous loved ones of Venezuelan political prisoners, including Patricia Ceballos, whose husband Daniel is among the most high profile prisoners. The first award, introduced by U.S. Congressman and NED Board Member Peter J. Roskam, was given to Antonio Ledezma, the Mayor of Caracas who has been imprisoned since February of this year. Ledezma is the founder of the political party Alianza Bravo Pueblo, or Fearless People’s Alliance. He was arrested in February 2015 when heavily armed government thugs stormed his office and seized him for an alleged conspiracy to overthrow the state. Receiving the award in her husband’s stead, Ledezma’s wife Mitzy Capriles ended her remarks by reading a poignant excerpt froma letter written by Ledezma just hours after his arrest. NED President Carl Gershman then presented the second award to Tamara Sujú, a renowned human rights defender who lives in exile in the Czech Republic. Sujú is the founder of FUNDAPRES.O.S., an organization that works to provide aid to Venezuelan prisons, the president of Nueva Conciencia Nacional, and the Director of Venezuela’s Ladies In White Foundation. In her remarks, Sujú applauded the members of Congress present at the award for their dedication to Venezuelan human rights and democracy, and called on Latin American governments, as well as the Organization of American States, to stand up against Maduro’s authoritarian regime. “The Venezuelan people cannot take on the irrational army and dangerous government alone,” Sujú said. 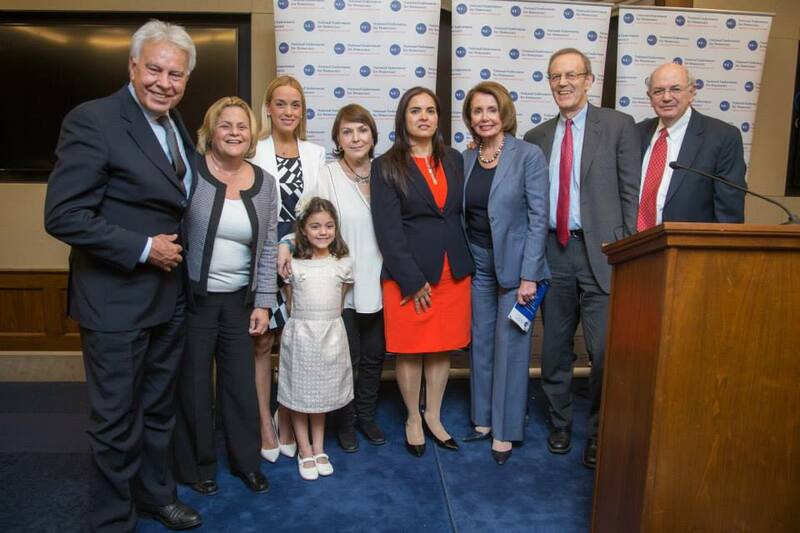 The 2015 Democracy Award was also a show of bipartisan support for democracy in Venezuela and around the world, as members of congress from opposite sides of the aisle stood on the same stage to promote the cause. As Republican Congresswoman Ileana Ros-Lehtinen joked, “If you see Ileana Ros-Lehtinen and Nancy Pelosi sharing the stage, that tells you what a great organization the NED is, because they don’t stand for any political parties.” Moments later, Republican Congressman Ed Royce and Democratic Congressman Eliot Engel – Chairman and Ranking Member, respectively, of the House Foreign Affairs Committee – took the stage together. “We speak with one voice on the Foreign Affairs Committee, and that is the voice of freedom,” declared Engel. Engel then paid tribute to Leopoldo López, the leader of the opposition party Voluntad Popular and the former mayor of the Chacao municipality in Caracas, who has been detained in the Ramo Verde prison since February 2014. He was accused of inciting violence during the wave of social protests that took place in early 2014. But ultimately, it was the demonstration of the strength of family that made the deepest impression on the audience, as Lilian Tintori and her 5-year-old daughter Manuela accepted the award on behalf of López, who has now been in prison for 15 months. Beyond recognizing the strength and courage of current political prisoners, speakers at the event – members of Congress in particular – outlined the specific actions necessary to forward the situation in Venezuela. Congressman Royce insisted that “President Maduro should accept calls from across the region, from across the world, to free all political prisoners, and to allow liberty, allow democracy to flourish in Venezuela.” Congressman Engel suggested working with OAS to install a more robust electoral observation system.